The UK's best selling white inkjet printable CDR! This extremely popular disc uses Acu-Disc�'s unique scratch resistant printable surface and brilliant white formula, to create exceptional results across a wide range of CD printers. With the Acu-Disc� you will be able to take advantage of the high quality moulding taken from optical grade polycarbonate. This combination ensures for excellent burning and playback performance as well as superb autoloading compatibility. With the full printable surface being full surface with a metallized hub, your artwork is guaranteed to look great on the Acu-Disc� White Inkjet CDR. ACU DISC have become the UK's best loved manufacturer of Blu-Ray Discs, Blank DVD-R and Blank CDR media. This is due to two clear principals; develop high quality products for the professional disc market and ensure that this manufacturing quality is consistently achieved. 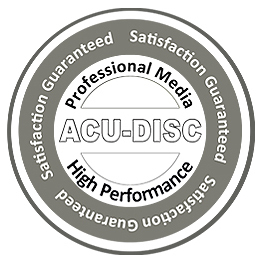 ACU-DISC� are so confident in the quality of their blank media they produce, that they are the very first manufacturer of optical discs to offer a Satisfaction Guarantee. Whether you use a CD/DVD copier, printer or publisher, ACU-DISC� have the perfect disc for you. In a CD-R the recording layer is made with organic dyes — greenish cyanine dye, golden phthalocyanine dye, or silver-blue azo dye. The laser of your CD-R/CD-RW drive heats the dye to a temperature of about 200° C, irreversibly melting a pitted pattern into the recording layer. 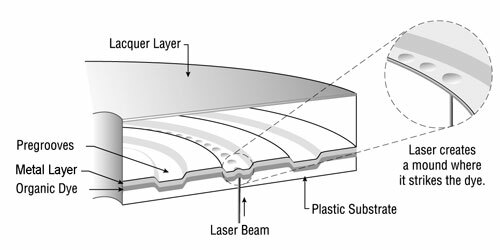 A plastic layer alongside the dye expands into the newly available space creating a pit pattern similar to that of a conventional CD. Your CD player reads this highly reflective pattern for playback. Because the plastic layer melts into the dye layer to set the pattern, CD-R discs cannot be re-recorded. 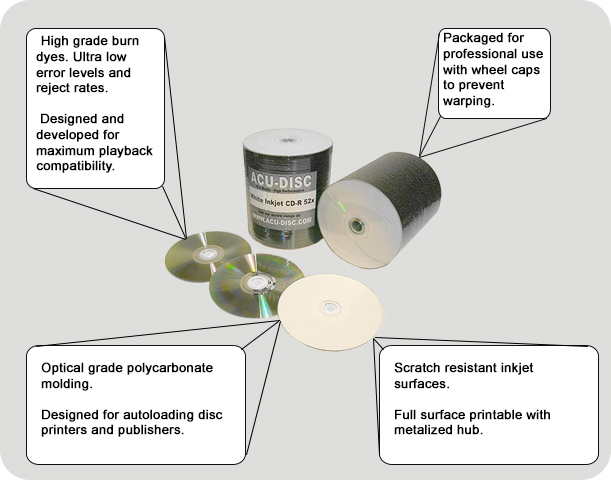 Select the needed Check box and click buy of Acu-Disc � White Inkjet CDR.